Merlins of Wakefield01924 339933work ShopMerlins of Wakefield was established in 1995 by Phil Peters and Mark Lee. Both are professional magicians, performing close up and carbaret magic across the UK. They also advise and supply many props, books, DVDs and routines. Merlins of Wakefield was established in 1995 by Phil Peters and Mark Lee. Both are professional magicians, performing close up and carbaret magic across the UK. 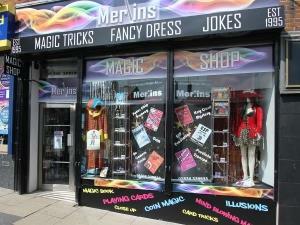 Merlins is located in the centre of Wakefield and is open every day except Sundays from 9:15am to 4:45pm, and are happy to offer advice and guidance to ensure you purchase the best magic effects around.